Register Log In GliderCENTRAL Forums Real Stories Rainbow Memorials Our glider may be losing the fight. Came home today to find that Gizmo has passed on. My wife and I will be keeping a close eye on Bella. She's defiantly not doing well, when I found them they were both in their breeding box and she was just shaking while laying next to him. We believe she is about 5 years old. Hopefully we can find a suitable mate for her. How long should we wait before adding another glider? Is sooner better or could she become aggressive since she's clearly grieving. Target, I am so, so sorry to hear that about Gizmo. There are several places you may look for older sugar gliders. The breeder I got my four balls of trouble from sells the breeders she's retiring with free shipping. Check out TPG Rockin' Retirees if that might interest you. Again, I'm sorry for your loss. My prayers for Bella's health, now. You can read Gizmo's story here. I am so very sorry for your loss Glide free Sweet Gizmo. Sorry to hear of Gizmo passing, I hope you can find some happiness in memories of him. I'm sorry for you loss.. I would try to get one in with her sooner rather than later. Obviously she is upset but you don't want her to fall into depression. I agree that you should look for an older established glider to pair with her.. Reitred breeder males are usually fairly easy to find.. There are always lots of rescues available but lots of those tend to come with their own obstacles that probably wouldn't be conducive to quick pairing with a glider that recently lost their mate. Just make sure to be very careful about intros and go slow if Bella or the new glider seems resistant. Again, I am sorry for your loss of Gizmo. Thank you everyone for your kind words. Bella is being much more loving than she ever was before, Gizmo was always the attention seeker. We have found a 3 year old glider named Diego at a nearby breeder. So hopefully by this weekend Bella will have someone new to get to know. So sorry for your loss. I hope Bella pulls through... I would think a new mate would be vreat. The sooner the better. Im so sorry about Gizmo! He sounded like such a great boy! We used to post on each others and it was beautiful the love you showed him! 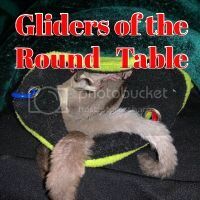 As for older gliders try a rescue! I just got asked to rescue a 3 year old girl! I think you would do better with another boy when bonding! I cant keep the little girl, but if you are interested lmk! once again im so sorry! Thank you everyone for the support. Bella now has a new mate. They bonded instantly. I'm ecstatic to hear that & glad for her! !